It’s very overdue but I have been waiting for a refurbishment of my website so that I can mail out more easily! I would love your comments/feedback on the website. At the moment I am participating in a 12 week fitness challenge at my local gym. The feeling of increased wellness and strength that I am experiencing is quite remarkable. I have always agreed with the belief that weight bearing exercise is beneficial in so many ways, particularly for women, who are more inclined to develop osteoporosis. Research has shown that strengthening exercises are both safe and effective for women and men of all ages, including those who are not in perfect health. In fact, people with health concerns—including heart disease or arthritis—often benefit the most from an exercise program that includes lifting weights a few times each week. Strength training, particularly in conjunction with regular aerobic exercise, can also have a profound impact on a person’s mental and emotional health. 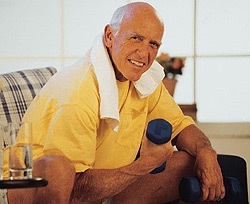 Scientific research has shown that exercise can slow the physiological aging clock. While aerobic exercise has many excellent health benefits—it maintains the heart and lungs and increases cardiovascular fitness and endurance—it does not make your muscles strong. Strength training does. Studies have shown that lifting weights two or three times a week increases strength by building muscle mass and bone density. One 12-month study conducted on postmenopausal women at Tufts University demonstrated 1% gains in hip and spine bone density, 75% increases in strength and 13% increases in dynamic balance with just two days per week of progressive strength training. The control group had losses in bone, strength, and balance. Strength training programs can also have a profound effect on reducing risk for falls, which translates to fewer fractures. I will be conducting a course here at The Gap Clinic on October 11. I thoroughly enjoy teaching these days as they are designed for non-practitioners and the thrill that students experience when they see how simply they can make changes is contagious! For more information, check out the EMM-Tech page.